The bursting of the dotcom bubble and the terrorist attacks of September 11, 2001, have brought into question received wisdom about strategy. This volume reviews the lessons to be learnt from these events, and proposes that, as a result, strategy in the twenty–first century will have to develop along new lines. Comprising a series of outstanding contributions by experts in the field, the collection focuses on changes that are occurring in how strategy is viewed, formulated and analysed, and looks forward to the future of strategic management. It discusses the emergence of new modes of thinking, new models, and new processes, and lays foundations on which strategy can build in future. 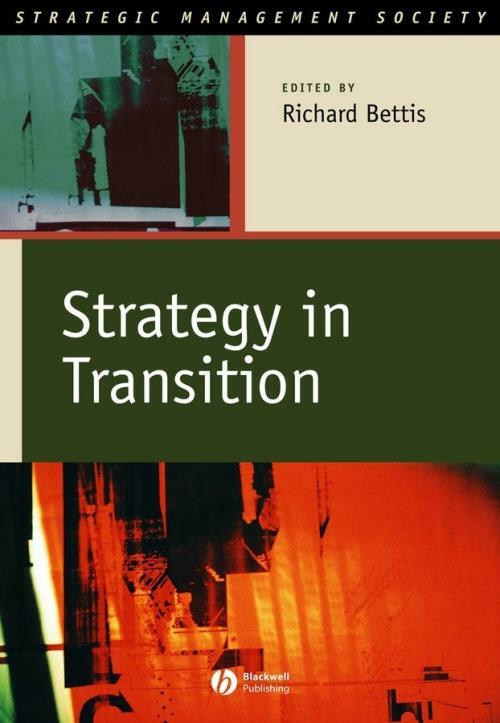 Introduction to Strategy in Transition (Richard A. Bettis). 1. Incumbent s Adaption and Capability Building on the Internet: Empirical Tests of Innovativeness in the US Banking Industry (Carmen Weigelt). 2. Competitive Advantage, Knowledge Assets and Group–Level Effects: An Empirical Study of Global Investment Banking (Boris Durisin and Greg von Krogh). 3. Happy Kids and Mature Losers: Differentiating the Dominant Logics of Successful and Unsucessful Firms in Emerging Markets (Krzysztof Oblój and Michael G. Pratt). 4. A Strategic Perspective on Capital Structure: The Implications of Trying to be an Innovator (Jonathan P. O Brien). 5. The Value of Managerial Learning in R&D (Paolo Boccardelli, Alessandro Grandi, Mats G. Magnusson, and Raffaele Oriani). 6. The Paradox of Social Capital: Structural, Cognitive and Relational Dimensions (Linda F. Edelman, Michael Bresnen, Sue Newell, Harry Scarbrough and Jacky Swann). 7. Strategic Innovation in Financial Services (Laura A. Costanzo). 8. The Role of Organizational Culture in the Corporate Branding Process at Silicon Valley Firms (Stanley J. Kowalczyk). 9. Intangible Capital in Industrial Research: Effects of Network Position on Individual Inventive Productivity (Jukka–Pekka Salmenkaita). 10. The Impact of Intangible Resources: How Organization Reputation and Employee Know–How Affect Performance (Alice C. Stewart and Henry Y. Zheng). 11. The Fall of a Silicon Valley Icon: Was Apple Really Betamax Redux (Joel West).